So far, we’ve seen two examples of red and blue pencils from Japan – the first rate Kita Boshi 9667, and the very unusual finger-jointed Mitsubishi 2667. Let’s continue our exploration of this interesting pencil format by looking at the mainstream offerings from Japan’s largest pencil manufacturers, Tombow and Mitsubishi. Tombow makes the round 8900 VP. (VP for Vermilion/Prussian Blue.) 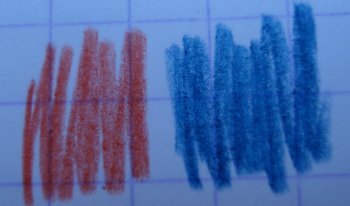 There is also a very interesting variant – the 8900 VP 7/3 – a 70% red, 30% blue pencil! Mitsubishi counter with their own round red and blue pencils, the Colour Pencil 2667, and an accompanying 70% red, 30% blue, Colour Pencil 2637. Mitsubishi also produce a hexagonal pencil, the 772. The Tombow CV-REA VP, an offering corresponding to the 2667EW, is the only product missing (to the best of my knowledge) from this review. A few observations about these pencils, starting with the more subtle distinctions. Two pencils have bar codes, and three do not. I don’t know if there is any greater meaning. 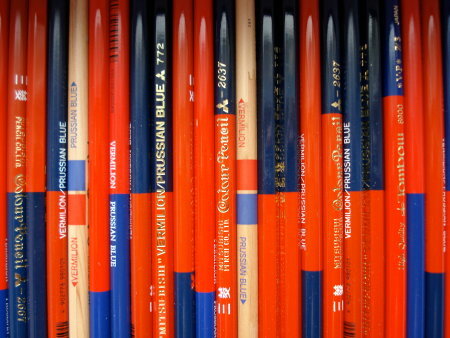 The various pencils may or may not be meant for individual sale, and some might be part of packaging that contains a bar code. The pencils without bar codes certainly have a cleaner appearance. 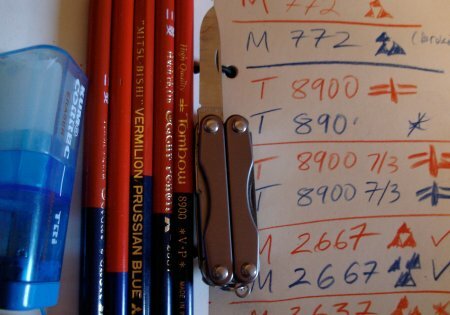 Proportion – the unequal proportion of the two colours and implied specialization of the 2637 and 8900 7/3 pencils is fascinating and charming! It is a rare and appreciated touch! 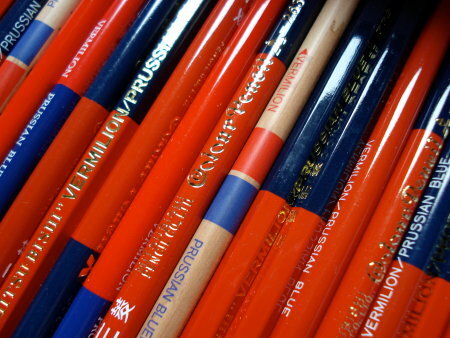 Lettering – the “C” in “Colour” on the Mitsubishi pencils is remarkable! A curl in a curl! It is a first rate traditional font. Varnish. 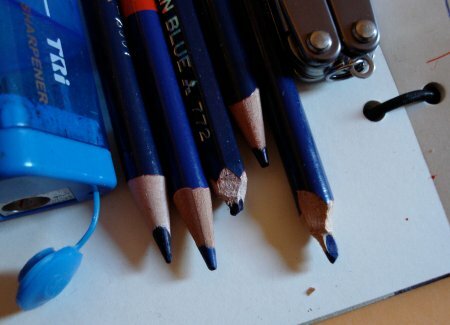 All five pencils seem to have nearly identical blue ends. Yet the red sides vary. The two 8900s seem the same, but the 26x7s are not. The 772 seems to be the same as the 26×7. The 772 is nicely done in another way. The Latin vs. Kanji characters on opposite sides make a nice juxtaposition. Made in Indonesia. Okay, I am slightly shocked. I have not previously seen a woodcase pencil from a Japanese pencil manufacturer marked “Made in Indonesia”. And adding to the curiosity is that the sibling 7/3 is marked “Japan”. Has anyone seen any pencils like this? Before answering that question, let me mention that these pencils all arrived unsharpened – and some were not co-operating with the Irish and German made KUM Correc-Tri sharpener! The blue ends were the worst – I gave up on the 772 and took out a pen knife. Guess what? The 772 was very hard to sharpen, even with a Leatherman Squirt pen knife. On the red side, the 2667 red and 8900 blue ends needed two tries after breakage. The wood quality and breakage issues of the 772 seem to mark it as a lower quality pencil than the other four. I retried the sharpening in my battery operated Panasonic sharpener, and it did much better. So as to how they write – all five wrote very well, with rich, higly pigmented lines. I didn’t distinguish much difference between them. My favourite is probably the 2667, based on ease of sharpening and the distinctive makings. We’ve seen red and blue pencils from both the US and Europe – and now thanks to the kindness of fellow pencil aficionado isu from the uncomfortable chair, I am able to present some pencils from the estimable Kita-Boshi in Japan. 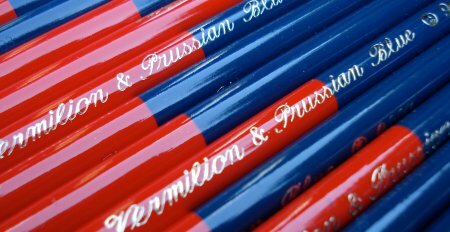 These aren’t just red and blue pencils – they are vermilion and prussian blue pencils! Round in shape, the pencils are lettered in gold script. They easily sharpen, and the varnish seems first rate. 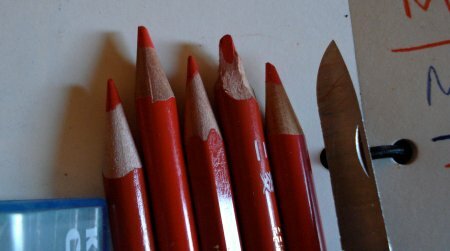 Unlike some other red and blue pencils, the leads seem absolutely first rate – as strong and smooth as those in quality graphite pencils. The red is more of an orange to my eye, which does meet the definition of “vermilion”, but I would prefer more of a “red” red. The blue has a great rich hue which is beyond reproach. A mighty fine interpretation of a traditional pencil. While Mitsubishi, Tombow, and Pentel may be better known in the west, there is at least one more quality Japanese pencil manufacturer of note: Kita Boshi. The Japanese pencil industry website tells me of many other companies in the industry, but Kita-Boshi are the only one of these whose products I have been able to source. I am not sure what is going on, because two different grades of the HIT No. 9900 appear to be different pencils, despite the same name and model number. The HB is hexagonal, with colourings I have never seen in a pencil: Brown with gold stamping, and a green band near the cap. Another difference: The 4B core is approximately 50% wider than the HB core. I can imagine the sincere but slightly awkward slogan “For Draftmen, Designers, Copy-writers” being enjoyed by many, though less so by Draftsmen and Draftswomen. Both pencils, like the Pentel, have matte rather than glossy finishes. This is fine with me, and is quite pleasing. It is a quality finish, while being quite practical. Both pencils sharpen easily, and lay down rich smooth dark lines. The 4B is almost unique as far as I know in being a round pencil at that grade. Its wide core, good looks, and quality graphite would truly make it a “hit” if it was more widely available. The HB is very good in its category. The standards of Japanese woodcase pencils are very high, and this pencil doesn’t disappoint. It looks good, writes well, and while not as rich as the Mono 100 or Hi-Uni, still lays down a line better than most pencils.